Dairy Projects International is a registered company based in Rotorua, New Zealand, in the centre of New Zealand's major dairy farming areas. It is managed by three directors, John Perrin, Trudy Laan and Lee Matheson, and a team of support and administration staff. 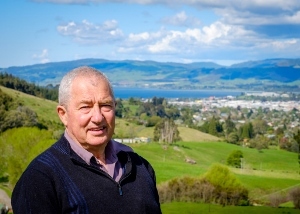 I am a registered, professional Farm Management Consultant and have been consulting and advising farmers since 1975, specializing in the provision of full management services to a range of clients, many who are absentee landowners. I have a proud record of achieving profitable results for my clients. Initially I specialised in full supervision services for absentee owners of sheep and beef farms. During that time I gained considerable experience from sheep & beef breeding schemes; sheep & beef management; intensifying and developing profitable farming systems. During the 1990's business planning identified a need to diversify many large-farm clients' businesses into dairy farming. We were instrumental in the strategic planning processes to make these decisions; implemented feasibility studies to determine the viability of each project, and business as a whole; were project managers of the conversion and responsible for delivering the results as indicated in the initial studies. Within the last 12 years we have completed six major dairy conversions ranging in size from 300 to 1500 cows. Dairy Projects International capitalises on that practical experience. It is now being put to use globally, in the USA, South America and interest now from Asia. Both are PDF documents and require Adobe Acrobat Reader. I have owned and productively managed my own dairy farm. In 1982 I purchased a small engineering company and have since developed this into a large, successful business employing 10 staff, specialising in farm related engineering. In this time I have developed and created the "Reporoa High Lift Gate", a sought after backing gate for Dairy Parlour yards, which has been exported to the UK, Australia, Brazil, and Denmark. Showing light weight robust construction, this gate is able to travel over the top of cows in the yard and drop down at any point to provide a physical barrier to shift both large and small groups of cows. This gate has revolutionised cow handling at the milking parlour. The Reporoa High Lift Gate can be fully electronically automated to the level required and can, with the "dung-buster" attachment, clean the yard as it moves forward. Click here for more information about the Reporoa High Lift Gate. DPI has the professional support of water reticulation engineers, farm mapping and fencing specialists, research facilities and supply sources of New Zealand pasture seeds, New Zealand dairy genetics, and milking plant and parlour components. Export of advice and consultancy services to USA. New Zealand is largely bicultural and we understand the need to take local cultural factors into account in our management systems. We operate with indigenous people in New Zealand, providing consultancy and full management, and producing very profitable results, enabling groups to realise their social and cultural aspirations.